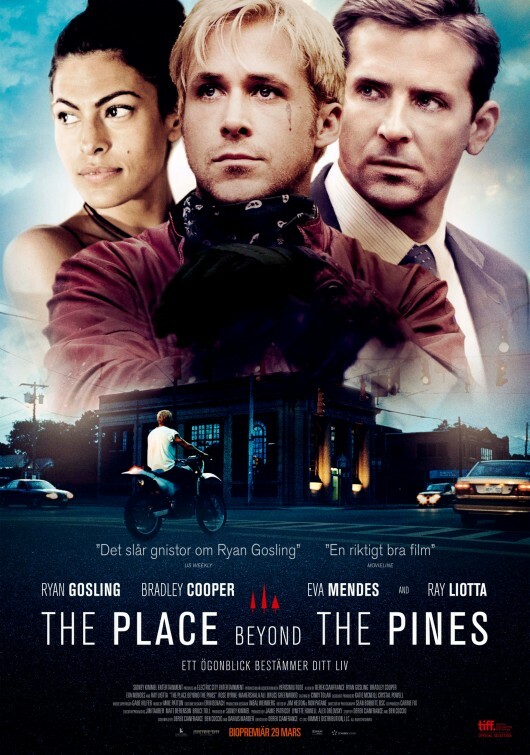 “The Place Beyond the Pines” sounds like a nice place for a picnic. Turns out it’s the Mohawk to English translation for Schenectady, and the title for the movie I saw today. Now in wider release, the movie stars Ryan Gosling (Drive) as bad boy Luke and Bradley Cooper (Silver Linings Playbook) as rookie cop Avery. Luke is a carnie with a motorcycle act who travels from town to town. When he revisits Romina (Eva Mendes from Hitch), whom he hasn’t seen in a year, he finds out he has a 3-month-old son. Romina has moved on and has a new man in her life. Although his son is doing fine and is in a happy and loving home, Luke figures the best thing for him to do is rob some banks so he can provide for this child. He is pretty good at this with his speedy motorcycle getaway, until the rookie cop, Avery trips him up. I was expecting some kind of epic battle between these two. That is what the trailer seemed to tease, and what the movie did not deliver. Oddly enough, that is not what bothered me. I was glad the movie swerved away from cliché. Where it went was somewhere between a Greek tragedy and a Shakespearean goat screw. It wasn’t about these guys, Luke and Avery. It was about what these guys did and the impact it had on their lives and the lives of their sons. This is a great setup, but the sons are pitiful people who do very little to engage the viewer. The whole movie was very plot-driven, and by that I mean the writer had the plot all laid out – and the actors executed it. Nothing seemed to come as a result of on-screen character development or pure character desires. I know Gosling is cute ladies – I get that – but he tries too hard to be Steve McQueen. Cooper shows off his acting chops and carries the last half of the picture. I wanted to see more from Eva Mendes, and not in the way that you think. She has done some amazing work in the past, but here she is relegated to being the mom who seems embarrassed and ashamed by everything – including her role. The movie was good at times, even gripping for a moment or two, and then it fell into a slice of life in the usual poor man versus lawman drama. There was great potential here. I walked out of the theater thinking this was probably a great book that let you really see inside the minds of these characters and how they dealt with conflicting motives. From what I could see, this was never a novel, just a screenwriter’s attempt at an epic tale that came up short. This was an indie film, with no studio oversight, and I love those kinds of films. Unfortunately, sometimes, when you don’t have anybody to answer to, the script and the characters do not get fully developed. It’s so cool, and you want to just shoot it, and the result is not cool. I was in “Oblivion” today, the movie, and it was pretty cool. That is exactly what you want to say after you walk out of a sci-fi flick: that was cool. Tom Cruise (Minority Report) stars as Jack Harper, who is literally the last man on Earth (or – spoiler alert – maybe not) working drone maintenance duty with his partner Victoria (Andrea Riseborough from Brighton Rock). They put it simply up front, “We won the war and lost the planet.” In two weeks, Jack and Victoria can finally leave and go to Titan (the biggest Saturn moon, come on, keep up) where the rest of the earthlings fled. Jack and Victoria’s only contact is with mission control, run by Sally (Melissa Leo from The Fighter), who has the kind of southern accent that scares you. I half expected her to say, “what we have here is a failure to communicate.” With most stories, everything is going well until another woman enters the picture. When Julia (Olga Kurylenko from Quantum of Solace) falls from the sky, Jack has bigger problems than planet-destroying aliens. I understand this was a graphic novel, which I am too old for, but it sounds like something my 2-year-old granddaughter would like. Every night she looks up in the sky and says, “Where are you Mr. Moon?” In this movie, that would be a problem, because the invaders took out the moon up front and that is what caused most of the devastation. They did a great job of making Earth look completely decimated, and I understand there was no CGI – they shot it all in downtown Detroit. I am a fan of Tom Cruise, since he and I settled our differences years ago. Once again, his character’s name is Jack and he takes his shirt off, runs really fast and gets his nose broken. The movie also hits on many traditional sci-fi themes, but I stopped checking off plot points from other movies and just set back and let Tom Cruise, I mean Jack, save the day. The movie felt like classic science fiction, and wonderboy Writer/Director Joseph Kosinski (TRON: Legacy) held the world and the story together. With enough action, enough story and enough gadgets and explosions, he served up a nice two-hour movie. He stayed out of politics, environmental decay and all the other societal overtones modern storytellers get sucked into. I would tell you more about the movie, but I have a contractual agreement with my conscience to let you be surprised when I was surprised. And I was often surprised. All I can divulge is that I give this movie 3 ½ stars of out 5. I had to drive a few counties north to see “Trance,” the new hard-to-find movie from Director Danny Boyle (Slumdog Millionare), just like I had to venture south to find my wife – and both were worth the trip. With Boyle, all you can expect is something different. This movie is hard to explain, but I will close my eyes and try to remember what my brain will allow me to see. Simon (James McAvoy of Wanted) works in an art gallery protecting the paintings. When a daring theft goes awry and Simon takes a knock to the head, the police think Simon is a hero. I am not giving it away when I tell you that he was in on it. But he double-crosses his team, led by Franck (Vincent Cassel of Black Swan), and hides the painting. The only problem is he hid it from everybody: the people at the gallery, the cops, his crook buddy Franck and he even hid it from Simon. I would say he could not remember where he put it, but this movie is about what we remember, how we remember and what we do when we do not want to remember something. Just remember that. So, the best way to get a guy to do something is for a girl to ask him, and it works best when that girl is the lovely Elizabeth, (Rosaria Dawson of Rent) who is also a hypnotherapist. On a side note, I have been a big fan of Rosario Dawson since “Josie and the Pussycats,” a movie ignored by the Academy because of its depiction of our media-driven society as political satire. Was I just in a trance? Well played Rosario, well played. This movie felt like “Inception,” then moved into “The Eternal Sunshine of the Spotless Mind.” It is a remake of a 2001 British TV movie, but since the only British TV shows I watch are “Bennie Hill” and “Monty Python,” that did not matter to me. This movie did not rely on the hypnosis gimmick; it went deeper than that. After the first 10 minutes, when we find out Simon was in on the robbery, we begin to question everyone’s motive – as do the characters. In its soul, this is a character piece that explores why people do things. I know I give this Danny Boyle movie 4 out of 5 stars, and I know why I drove to Falls Church to see it: because I wanted to see something different. And I did. I did not want to see “Evil Dead” today. Not because I was scared, really. I wanted to see either the new Robert Redford or Danny Boyle movies released today, but I can’t find them. So, when two legendary Oscar winning directors can’t get wide releases for their movies, it must be time to enter into an evil dark realm and fight the devil who rules all things. That is not a shot at Harvey Weinstein, really. I liked the original, “THE Evil Dead” with Bruce Campbell (The Evil Dead – duh) as Ash. It was campy and quirky and a breath of fresh blood in its time. So was it a good idea to give first-time director/screenwriter Fede Alvarez $14 million, the title and concept? The short answer – no. Poor little Mia (Jane Levy of Suburgatory) has a drug problem, and she tries to kick it by going to her mother’s remote cabin in the woods. Three friends and her brother, David (Shiloh Fernandez of Red Riding Hood), are committed to keeping her there until she is all better. This does start out as a good reason for them to be there together. It’s a nice, dusty old cabin that has not been used in years, but there is a great electric carving knife and a nail gun. How odd to highlight those out-of-place items early in the movie. I was sure that old chainsaw in the shed would never start. They are going to be just fine, even with that terrible smell they mention nine times, as long as nobody cuts the barbed wire from that old book and starts to read it. My fourth grade teacher, Mrs. Nelson told me that reading a book would not kill me. She was so wrong. Wait – I just heard, if I can get to Utah, Robert Redford will screen his movie for me. What was my Expedia password…oh, “Evil Dead” – 2 stars, one step above ordinary hack horror. Bless you Sam Raimi for not re-making it, but damn you to hell for letting someone else do it. You should have just kept putting roman numerals after the title like everybody else.